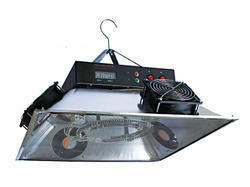 We offer high quality Electric Brooder that is developed and designed by industry expert. This electric brooder is used to confine chicks with their feed and water until they are old enough to go outside. The emitted infrared heat of these brooders is very effective for the brooding of chicks. Brooding Ar. Cov: 200 sq.ft. Electric Con: 2 Kv. / hr. Consumption Max Unit: 2 Unit/Hrs. Consumption Min Unit: 1 Unit/Hrs.